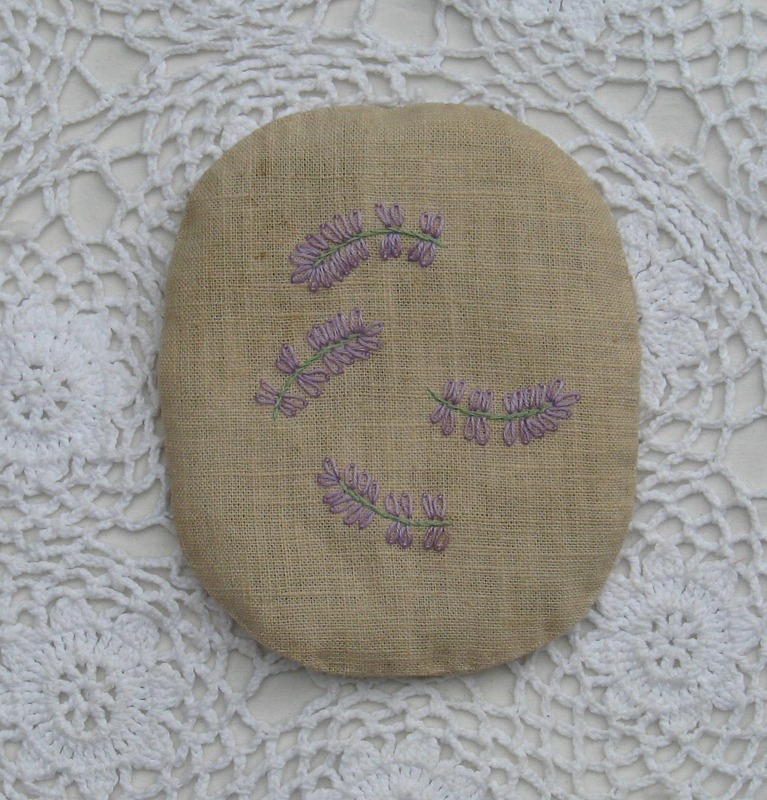 I’ve spent the last couple of weeks catching up on Spring time sewing and embroidering these little lavender sachets……mostly I’ve been inspired by all the little bursts of unexpected colour that have been dotting up around our raised vegetable beds and sometimes by the vegetables themselves once they start to flower…..rosemary blossoms and chives flowers get sprinkled into sandwiches and over salads, as do yellow rocket flowers……broccoli flowers though are left for the bees as it’s somewhat stinky. 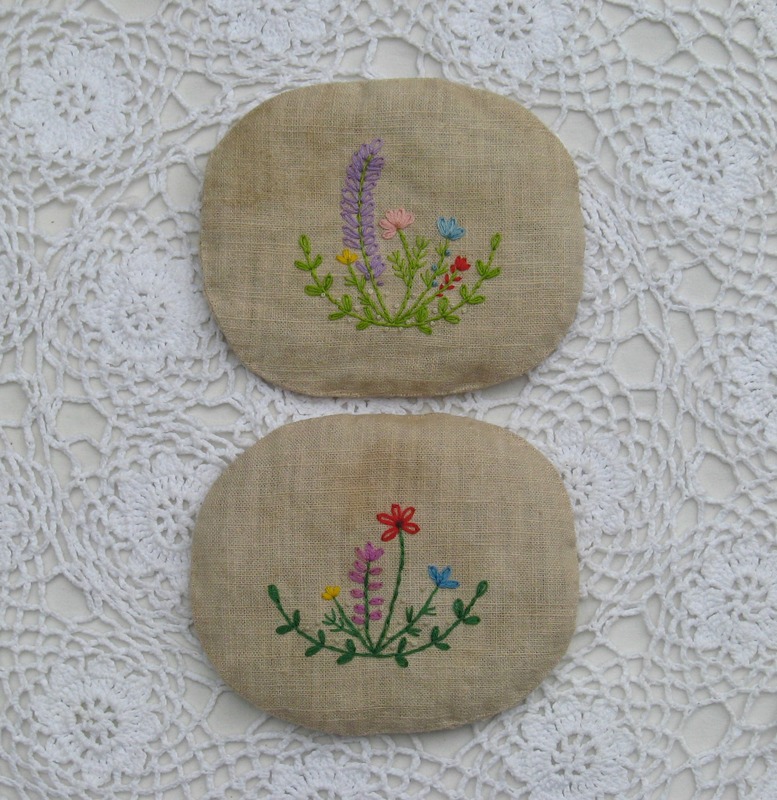 When we go for walks over the marshes or up to the woods, I quite often take a pocket sized bundle of blotting paper (torn and folded into small pieces) and snip little samples of wild flowers and blossoms, placing them between the leaves to use later when I’m home….. 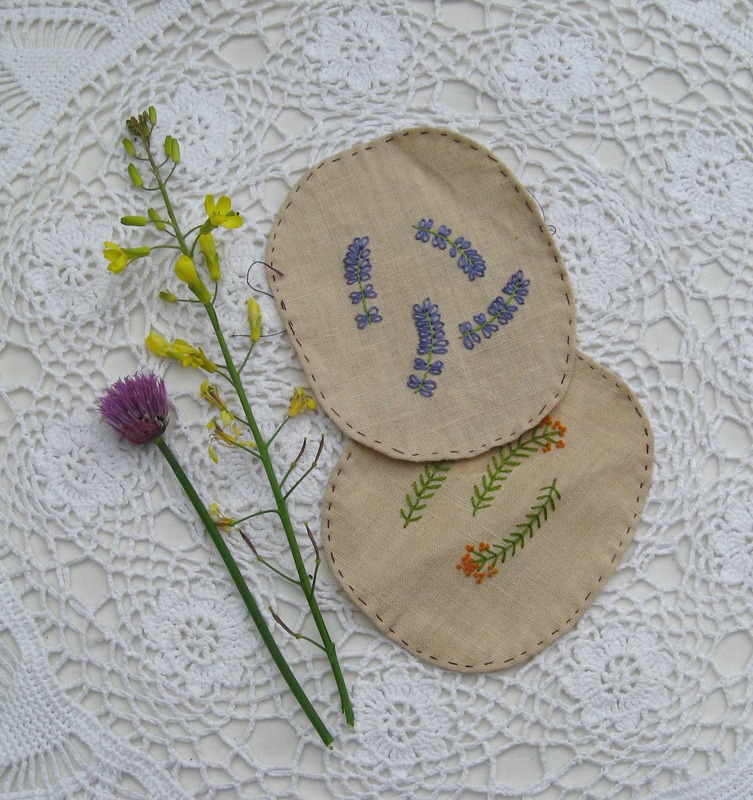 Though the weather has been a bit temperamental the last week or so (heavy showers of rain, hail, wild winds followed by sunshine which makes me then wonder did I dream the hail earlier) and thermals are still being worn as it’s gone proper chilly again, I’ve found working on these botanical embroideries really relaxing, pulling out strands of vintage embroidery silk and making small stitches, trying to imagine how the flower would look fallen, scattered across the fabric……. 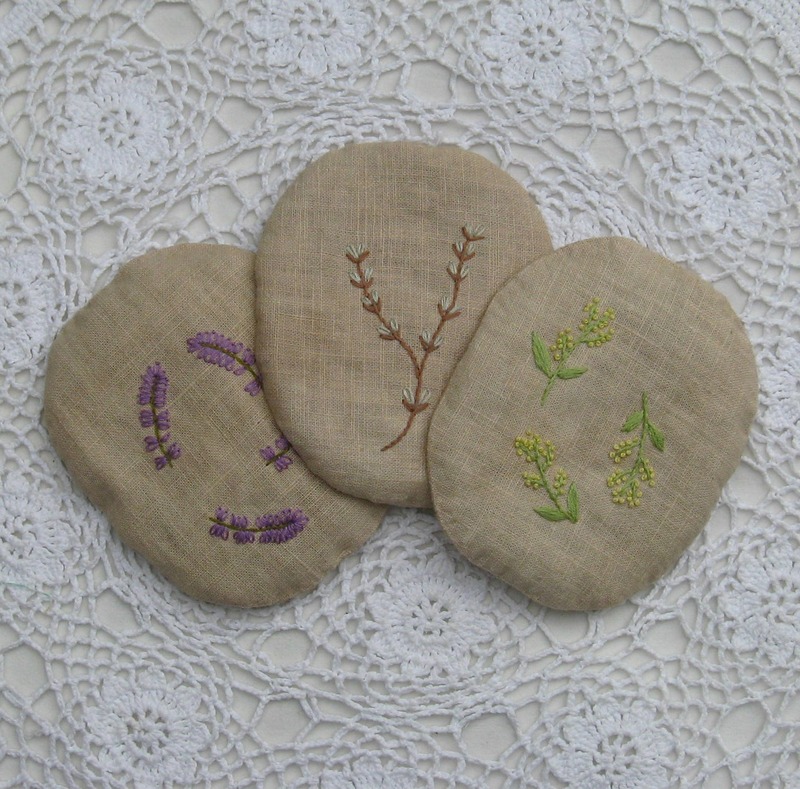 The sachets themselves are made from some beautiful Irish linen, soft but with an almost rough weave, it was originally a shirt made by my friend Anne (Queen of knitting and dressmaking too) but after she’d finished it she decided she wasn’t so happy with it so she gifted it to me as she thought I’d be able to do something with the fabric….. I carefully cut around the seams and cut the shirt down into 7 pieces (sleeves, fronts, back and 2 pieces for the yoke) then hand dyed it as the linen originally was cream in colour…I like this slightly darker oatmeal colour more, it’s a good base to work colour against. 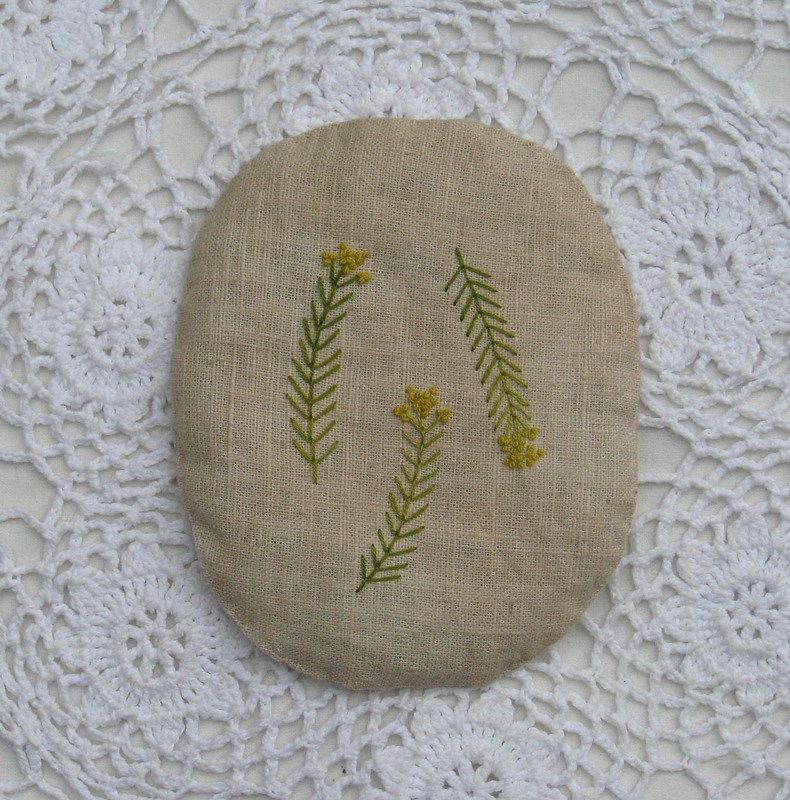 The sachets are all hand sewn, the raw edges are basted under a few milimetres (a bit like when you’re sewing needle-turned applique) and I found it easier to do this without using any pins as they just seemed to get in the way…..there’s a slight variation in size but on average the sachets measure 13 x 11 cms and lay comfortably in the palm of your hand…they’re lovely to hold, the combination of textured, slightly biscuity coarseness of the linen, smooth silks and raised stitches with the scent of lavender make them highly tactile and a pleasure to touch……. I took some of the sachets with me to the Glory Days Spring Fair * at the weekend and they proved very popular, I think it’s the smell of lavender, people seem to make a beeline for it…..sachets were picked up and held, stoked and coased like kittens… I’ve also put some sets into my Folksy shop, each selection of botanical embroidery different. *several times on my blog I’ve mentioned my friend Sasha, she makes the most gorgeous and wonderful creations from vintage fabrics, car boot and flea market finds….Ruth (who owns Glory Days) has now got a whole load of Sasha’s toys and bunting in stock (a selection of which are now on Ruth’s instagram page) including for the first time Sasha’s clouds and some completely smile inducing cloud bunting (Bernard bought me the very first one of these she made as a mother’s day present some years ago)…contact Ruth at Glory Days for what is still available….Sasha’s toys are all one of a kind and unique, because of the materials used no two pieces are ever going to be quite the same. Sasha doesn’t sell on-line and I don’t think she has any fairs lined up over the Summer, so a trip to Holt is seriously recommended…. it’s always worth a trip to Holt and popping in to say hello to Ruth, she’ll always greet you with a smile and you can’t help but feel happy in her shop.